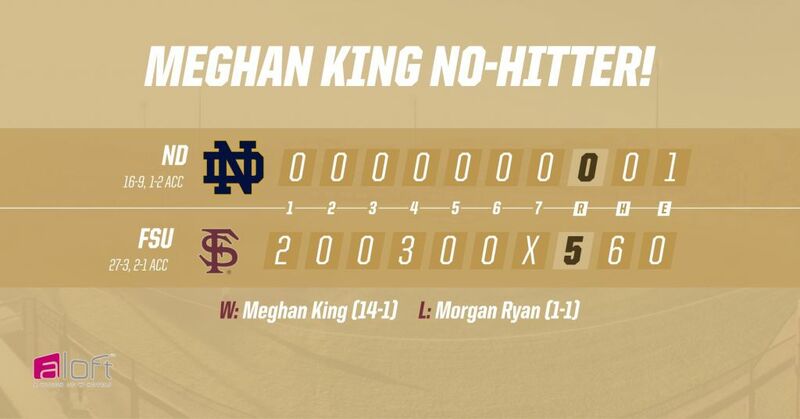 TALLAHASSEE, Fla. — Retiring 21 of the 22 batters she faced on Sunday, redshirt senior pitcher Meghan King tossed the third no-hitter of her career on Sunday afternoon as No. 3 Florida State (27-3, 1-2 ACC) defeated RV Notre Dame (16-9, 1-2 ACC) by a score of 5-0 to take the series against the Irish. King (14-1) allowed only one baserunner in the top of the seventh inning on an FSU fielding error and finished with three strikeouts. The redshirt senior from Parkland, Fla., had previously thrown a perfect game in six innings against Tulsa on March 12, 2016 and combined with Cassidy Davis for a five-inning perfect game versus Northern Iowa on February 23, 2018. Florida State is now unbeaten in its last 50 conference series, posting a 46-0-4 mark against ACC foes, including 36 sweeps. The Seminoles last lost a conference series at Maryland on May 5-6, 2012. Florida State loaded the bases with the first three batters on singles by Cali Harrod and Sydney Sherrill, along with a walk by Carsyn Gordon. A Notre Dame error off the bat of Elizabeth Mason allowed the first run to score and an RBI groundout by Dani Morgan made it 2-0 Seminoles. It marked the 21st time this season that Florida State has scored in the first inning and the Noles have tallied a total of 69 first-inning runs so far in 2019. The Seminoles have scored more runs in the first inning than 93 other Division I teams had scored all season entering the weekend. Makinzy Herzog opened the Seminole fourth inning with a single to left, extending her hitting streak to 13 games. Following a Harrod walk, Gordon hit a two-out RBI single to left field to make it 3-0 Seminoles. Sherrill added an infield single to load the bases and Mason extended the lead to 5-0 with a two-run double to left. The Seminoles will continue their homestand this week with a game against Florida A&M on March 19 at 6:00 p.m. Links for live stats and ticket information will be available the softball schedule page of Seminoles.com.